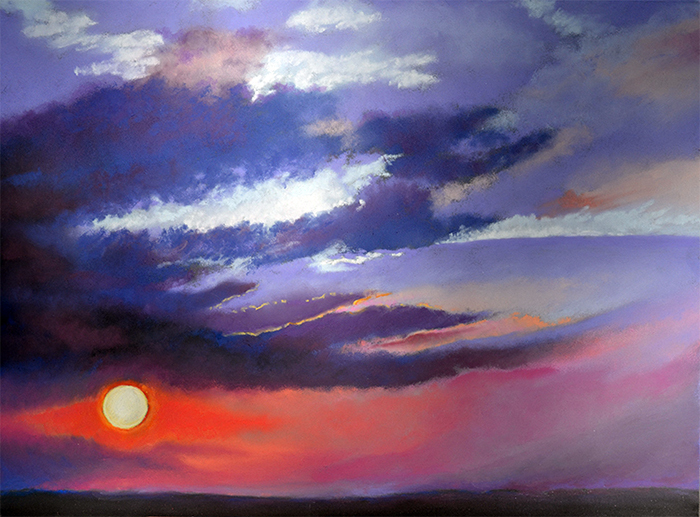 “Cornell, End of Day” is by Academic Web Services multimedia designer Jo DeSnyder-Rolfe. The chalk pastel was one of the entries in the first art show organized by Curriculum Design and Development. By day, it’s Candice Johnson, Grand Canyon Education curriculum developer. But by the rest of the day, it’s Candice Johnson, historically accurate Grecian clothing builder. 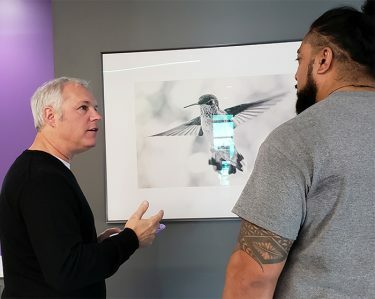 Johnson displayed her creative prowess in the first Curriculum Design and Development Employee Art Show on Friday in the 27th Avenue Office Building. 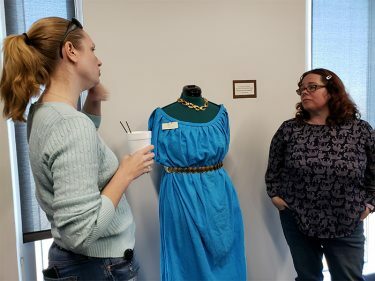 Candice Johnson (left) speaks to Joan Beckner about the Grecian dress she created for the show. Her entry into the show: a cerulean Ionic chiton, a Greek garment popular in the fifth century BC that was usually made out of gauze from wool or linen. Johnson used cotton gauze for her chiton, spending 15 hours making it as a member of the Society for Creative Anachronism. The group researches and re-creates the arts and skills of pre-17th-century Europe. She has been seriously involved in the Society for about eight years, she said, though she grew up around SCA all her life – her mom was involved in the late 1970s and early 1980s. “The person I learned this pleat-and-band style from actually went to Greece and studied the statues in order to re-create how they could have done it,” Johnson said. Not only does she sew historically accurate garments for Society historical re-enactments (and has won blue ribbons at the Arizona State Fair for her sewn beadwork embellishments), she has delved into banner dyeing, gold leafing, the illumination of scrolls, jousting and even period cooking. Curriculum designer Joan Beckner suggested organizing the art show, an idea she brought from a previous job at another university. Academic Web Services multimedia designer David Pinter, a professional photographer whose images have been showcased at Sky Harbor Airport Gallery, submitted “Mad Lammie” to the show. 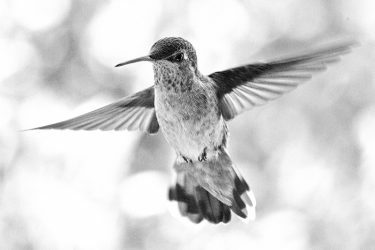 The black-and-white, close-up photo captures a hummingbird mid flight. Pinter was sitting outside when he spied the hummingbird at the bird feeder in his yard. He had his camera nearby and wasn’t even ready to start shooting. “I started taking photos of the bird – GZZK! GZZK! GZZK! – next thing I know, it hated the sound. It went THWOOP! THWOOP! right in my face. … Every time it came back, it had a mad look on its face,” said Pinter, who said his photo in the show was a happy accident. Pinter, a western Massachusetts native who loves hiking, mountain biking and nature, notes that his real artistic passion is architectural abstracts. Pinter (left), a professional photographer who works in the Academic Web Design Department, talks about how he got the perfect shot. Pinter loves uncommon perspectives of buildings – beautiful shapes, patterns, the contrast of shadows and light. Academic Web Services multimedia designer Jo DeSnyder-Rolfe colored Friday’s art show with several of her chalk pastel drawings: one titled “Fall Poms 2,” of a happy gathering of ruddy pomegranates, and another titled “Cornell, End of Day,” of a yellowy orb of sun hanging jauntily in the corner, a splay of clouds oozing around it. She created the sunset drawings from images taken at Rocky Point, Mexico, and in Ithaca, N.Y., when the artist was visiting her son, who received his doctorate in engineering from Cornell University. The canvas of pomegranates is of fruit from a pomegranate tree in her backyard. DeSnyder-Rolfe, who has worked as an illustrator and botanical artist, earned a bachelor of arts degree in studio art before her career in advertising and then education. Ruth Douthitt’s career has followed a similar path from art to education. She earned a bachelor’s degree in art and master’s in education. 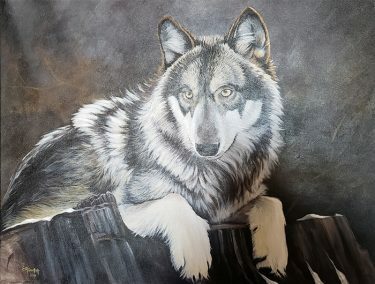 The acrylic painter contributed a couple of her paintings to the show, including “Mood,” of a wolf resting on a rock, and “Touch the Sky,” which warmed the room with an orangey, bright white, yellow sunset glinting off the rippling waves of a calm ocean as an expansive cloud-covered sky stretches overhead. Although her job as a curriculum developer requires her to develop courses students take at GCU, “The arts is my passion.” She has shown her work at galleries in New Bern, N.C., and Scottsdale, Ariz.
Making a living exclusively as an artist is difficult, she said, and, oftentimes, artists go down other career paths. Outside of delving into painting, Douthitt draws in pencil, writes and sings with the Chapel Worship team at the 27th Avenue Office Building. “Mood,” an acrylic on canvas, by Ruth Douthitt. The Curriculum Design and Development team thought the show was a good way to find pieces to decorate some of the conference rooms the department uses. It also helped build a sense of community, much like the department’s Christmas decorating competition with Academic Web Services. And it shines the light on the hidden talents of GCE’s employees.